Reason for stay: To decrease fall risk and increase Activities of Daily Living (ADL) functionality. Clyde Beaty came to The Emerald Peek as a patient of Hudson Valley Hospital following a fall at home. Sandy Gomas, our registered nurse (RN) care manager and Patrick Gallagher, our RN supervisor, greeted Clyde and his family upon arrival. Katie Cullum, patient concierge, and Tom Cirrincione, director of rehabilitation, and Vincent Zaccheo, our dietician, met with Mr. Beaty and his wife within an hour of his arrival. He was soon followed by his wife, daughter and granddaughter. Clyde faced a few challenges when he came to stay at our community. His lower extremities were weak. In addition, Clyde was somewhat non-compliant with his diet and his need to wear his hearing aid devices. His family was having trouble working with Clyde at home and was looking to build his strength, and his understanding of how important his compliance is to his recovery. His family also told the team how important Clyde’s grandchildren and great-grandson, Charlie, are to him. Julie, Clyde’s physical therapist and Tosin, his occupational therapist, evaluated Clyde and determined a course of modalities that would help him gain strength quickly and help Clyde begin to reclaim his independence. 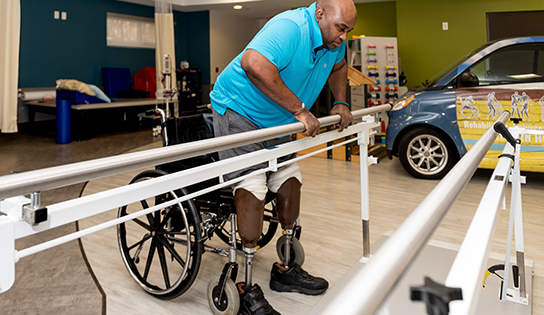 Julie focused on Clydes’s lower extremities, setting goals of increasing gait/balance while standing as well as transferring from bed to wheelchair with minimal assistance. For Tosin, working on toileting, hygiene, and dressing became paramount. Katie, Clyde’s concierge, worked with Clyde’s family to help with his hearing devices and seeing that Clyde’s communication abilities improved. She worked with the family to change his hearing device from aids inserted into to the ear (which Clyde disliked) to a hearing device with headphones, which were much more comfortable for him. In addition, Clyde speaks nearly fluent Spanish, so our Unit Manager, Alex, began to speak Spanish to him, which Clyde thoroughly enjoyed and helped to increase his confidence. At the end of Clyde’s third week, he was able to complete all his ADLs (activities of daily living) with close contact supervision. He was also able to stand independently and ambulate 100 feet with a rolling walker.